English Noah (Hebrew: נוֹחַ, Noach; Arabic: نوح, Nūḥ; "Rest") was the tenth and last of the antediluvian patriarchs. His story is contained in the Hebrew Bible, in the Book of Genesis, chapters 5–9. The accounts of Noah's Ark and the Great Flood are among the best-known stories of the Bible. Noah is also portrayed as "the first tiller of the soil" and the inventor of wine. According to the Genesis account, Noah labored faithfully to build the Ark—no doubt the largest vessel yet constructed—at God's command, ultimately saving not only his own family, but mankind itself and all land animals, from extinction during the Flood. Afterward, God made a covenant with him, blessed him, and promised never again to destroy all the earth's creatures. The idyllic scene did not last, however, as Noah became drunk, had his nakedness exposed to his children, and ended up cursing his grandson Canaan, to be a slave. Despite portraying the death of nearly the whole of mankind as well as all animal life on earth, Noah's story is one of the world's favorite tales for children because of the zoo-like quality of Noah's Ark and the "happy ending" of God blessing Noah's family under a heavenly rainbow of hope. The actual end of the story, with Noah cursing his own descendants to be slaves, has been the subject of much elaboration in the later Abrahamic traditions, and is immensely influential in Western culture. The Deluge, Gustave Doré, 1832–1883. From the Dore Illustrated Bible, 1865. The story of Noah is related in the Book of Genesis, chapters 5–9. Noah was the son of Lamech in the tenth generation after Adam. Genesis describes the patriarchs before the Flood as living for more than half a millennium. Thus, when Noah was 500 years old, he became the father of his three sons, Shem, Ham, and Japheth. The dove returns to Noah with an olive branch. Finally, the waters began to recede, and the Ark came to rest on the mountains of Ararat in today's Turkey. 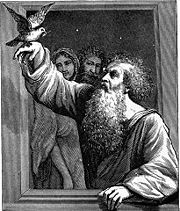 Noah sent for a raven, which he released from the Ark, and then a dove. Two times the dove returned to him, but on the third flight, she came back with an olive branch in her beak, showing that the waters had receded far enough for trees to reappear and grow leaves. Disembarking from the Ark, Noah built an altar to God, the first altar mentioned in the Bible, and made an offering. The Drunkenness of Noah by Michelangelo Buonarroti, from the ceiling of the Sistine Chapel. Michelangelo shows Noah drunk before his sons, and simultaneously, in the background, Noah planting his vineyard. Noah died 350 years after the Flood, at the age of 950, the last of the immensely long-lived antediluvian patriarchs. The maximum human lifespan, as depicted by the Bible, diminished rapidly thereafter, from as much as 900 years to 120 years within a few generations. If the biblical chronology is taken literally, Noah was still alive at the time of Abraham, although he is not mentioned in the stories of the Hebrew patriarchs. The righteousness of Noah is the subject of much discussion among the rabbis. The description of Noah as "perfect in his generation" implied to some rabbis that his perfection was only relative. 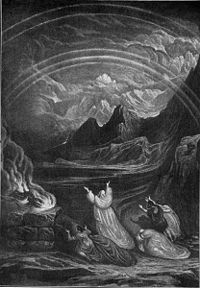 For example, Noah did not pray to God on behalf of those about to be destroyed, as Abraham prayed for the wicked of Sodom and Gomorrah. 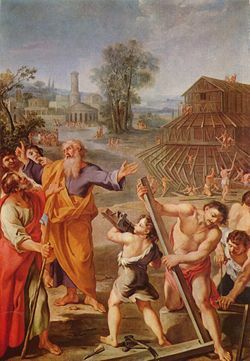 Other sages, such as the medieval commentator Rashi, held onto the contrary idea that Noah did preach to his contemporaries, and that the building of the Ark was stretched over 120 years, deliberately in order to give sinners time to repent. Other Talmudic traditions hold that Noah sinned by becoming drunk with wine after leaving the Ark. Nevertheless, he is named by the prophet Ezekiel as being a truly righteous man, along with Job and Daniel, in the days of the Exile (Ezek. 14:14–20). The Talmud also contains several speculations about the nature of Ham's sin, which was so serious as to deserve Noah's curse. In one version Ham actually castrated his father. According to another opinion, Ham defiled his father sexually. (Sanh. 70a; Gen. R. 36:4). 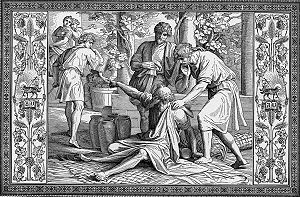 Still another rabbinical opinion declares that the mutilation of Noah was committed by Canaan, but was caused by Ham in telling his brothers of his father's nakedness in Canaan's presence (Ex. R. 30:5). Noah is called a "preacher of righteousness" in 2 Peter 2:5, and the First Epistle of Peter equates the saving power of baptism with the Ark saving those who were in it. In later Christian thought, the Ark came to be equated with the Church: Salvation was to be found only within its walls. St. Augustine of Hippo (354–430), arguing allegorically in The City of God, stated that the dimensions of the Ark correspond to the dimensions of the human body, and thus to the body of Christ, which is analogous to the Church. The equation of Ark and Church is still found in the Anglican rite of baptism, which asks God, "who of thy great mercy didst save Noah," to receive into the Church the infant about to be baptized. 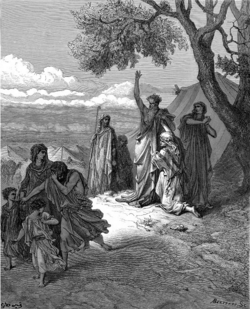 Noah Cursing Canaan, Gustave Doré (1832–1883), from the Dore Illustrated Bible (1865). The Bible's account of Noah's curse upon Canaan was used in the nineteenth century as a justification for slavery. Noah's three sons were generally interpreted in medieval Christianity as the founders of the populations of the three known continents, Japheth/Europe, Shem/Asia, and Ham/Africa, although a rarer variation held that they represented the three classes of medieval society—the priests (Shem), the warriors (Japheth), and the peasants (Ham). At the same time, some European thinkers proposed that Ham's sons in general had been literally "blackened" by sin. In the eighteenth and nineteenth centuries, this view merged with the Protestant interpretation of the curse of Ham to provide a religious justification for both racism and slavery. As late as 1964, Senator Robert Byrd of West Virginia read the text of the Noah story into the Congressional Record as part of a filibuster against the Civil Rights Act of 1964, saying, "Noah saw fit to discriminate against Ham's descendants." Similar arguments were used by white rulers in South Africa and Rhodesia to justify apartheid and minority rule by whites. Noah is commemorated as a prophet in the Calendar of Saints of the Lutheran Church - Missouri Synod on November 29. 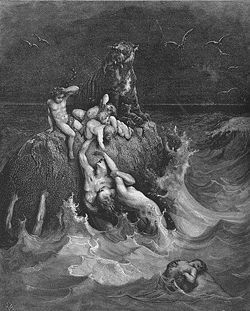 In the gnostic tradition, Apocryphon of John reports that the chief archon—not God himself—caused the flood because he desired to destroy the world he had made, but the First Thought informed Noah of the chief archon's plans, and Noah informed the remainder of humanity. Unlike the account of Genesis, in this version, not only are Noah's family saved, but many others also heed Noah's call. There is no Ark in this account; instead Noah and the others hide in a "luminous cloud." In the tradition of the Latter-day Saints, Joseph Smith taught that Noah is the same person as the angel Gabriel: "The Priesthood was first given to Adam;… He is Michael the Archangel, spoken of in the Scriptures. Then to Noah, who is Gabriel: he stands next in authority to Adam in the Priesthood" (Teachings of the Prophet Joseph Smith, p. 157). Noah is a prophet in the Qur'an. References to Nūh, the Arabic form of Noah, are scattered throughout the Qur'an, but no single narrative account of the entire Deluge is given. The references in the Qur'an are consistent with Genesis, with two important exceptions: 1) in the Qur'an, the Flood is a regional event, affecting only the "people of Noah," and 2) in the Islamic account, Noah does not become a vintner or get drunk on his wine, nor does he fall asleep naked or curse his grandson Canaan to be a slave to his brothers. The Qur'an emphasizes Noah's preaching of the monotheism of God, and the ridicule heaped on him by idolators. One tradition holds that 72 persons outside of Noah's family were saved in the Ark—people who had been converted by Noah's preaching. However, they did not have children after leaving the Ark, and thus all mankind descended from Noah's three sons. Another detail from Islamic tradition not included in the Biblical account is a reference to another son who chose not to enter the Ark. According to the documentary hypothesis, Genesis seems to contain two or more accounts concerning Noah, the first making him primarily the hero of the Flood, the second emphasizing him as a husbandman who planted a vineyard. As with many such parallel accounts in Genesis, one uses the term Yahweh for God, while the other uses the word Elohim. The theory of parallel accounts also explains why the story seems to "begin" more than once, as well as such possible conflicts regarding the time periods mentioned and details as to why one verse says that Noah brought "seven pairs" of "clean" animals into the Ark (Gen. 7:2) while a subsequent verse speaks of only one pair (7:8) of both clean and unclean animals. The "curse of Ham" has also given rise to much discussion. Many scholars believe Canaan's curse is primarily a religious justification for Israel's conquering and enslavement of the people of Canaan. Others add that may express a hope on the part of the sixth century B.C.E. compilers of the Torah that the Medes (Japhet) would join with the Jews (Shem) in restoring Jewish rule in the land of Canaan: "Blessed by the Lord my God be Shem, and let Canaan be his slave. God enlarge Japheth, and let him dwell in the tents of Shem, and let Canaan be his slave." Another issue is whether the Flood should be considered historical or not. Some archaeological evidence indeed exists indicating large floods in the Tigris-Euphrates valley. However, few scholars agree with the literal interpretation of Genesis' version, in which a single Great Flood covered the entire earth and killed all mankind and all land creatures except those on Noah's Ark. Numerous searches and several alleged sightings of Noah's Ark have been reported. Searches have concentrated on Mount Ararat itself, although Genesis actually refers only to the "mountains of Ararat." In 1876 explorer James Bryce climbed above the tree line and found a slab of hand-hewn timber, four feet long and five inches thick, which he identified as being from the Ark. In 1883 the reports were published that Turkish commissioners investigating avalanches had seen the Ark. In the twentieth century, investigations were hampered by political tensions resulting in climbing restrictions. 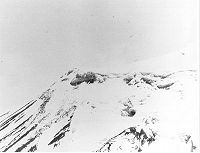 A so-called anomaly near the top of Ararat has been photographed, but climbers have so far been unable to relate it to the Ark. The Durupinar site, said to feature a large boat-shaped structure in the Tendürek mountains of eastern Turkey, attracted attention in the 1980s and 1990s. Despite these efforts, no confirmed physical remains have been found. A direct connection to the story of Noah and his Flood is seen by many scholars in the figure of Utnapishtim, a character from the Mesopotamian Epic of Gilgamesh. Utnapishtim tells Gilgamesh how he survived a great flood, and how he was afterwards granted immortality by the gods. Utnapishtim's account, though cast in a polytheistic background, shares many details with the story of Noah, including a warning from a god about the impending deluge, the building of a boat on which to save his family and animals, the sending forth of the raven and the dove, and a sacrifice to the gods after disembarking on dry ground. ↑ Cain and Abel are described earlier as bringing offerings to God, but an altar is not mentioned. ↑ Noah. jewishencyclopedia.com. Retrieved July 19, 2007. Best, Robert M. 1999. Noah's Ark and the Ziusudra Epic. Enlil Press. ISBN 0-9667840-1-4. This page was last modified on 6 December 2018, at 17:21.